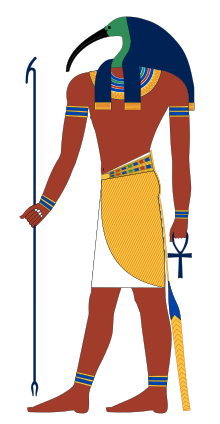 Thoth (/ˈθoʊθ/ or /ˈtoʊt/; frae Greek Θώθ thṓth, frae Egyptian ḏḥwty, perhaps pronoonced */tʃʼiħautiː/ or */ɟiħautiː/, dependin on the phonological interpretation o Egyptian's emphatic consonants) wis considered ane o the maist important deities o the Egyptian pantheon. In airt, he wis eften depictit as a man wi the heid o an ibis or a baboon, ainimals saucrit tae him. His feminine coonterpairt wis Seshat, an his wife wis Ma'at. This page wis last eeditit on 25 Juin 2017, at 19:01.